With monsters that hunger for flesh, ghosts that lie in wait, and brutality at the hands of humanity - this collection certainly has it all. Delving into the satirical, chilling and downright disgusting, this is a must read for those that like a bit of horror in their lives. I received this book in exchange for an honest review. 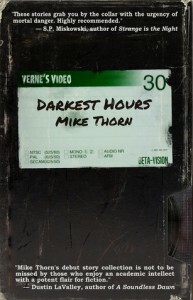 My thanks to Mike Thorn for giving me the opportunity! This anthology has sixteen individual stories, each offering varying degrees of horror in different forms; bizarro, quiet and psychological are just a few of the sub-genres that are incorporated. Chances are you'll find something that tickles your fancy within the wide spectrum that is Thorn's imagination, just as I did. I do, however, feel the need to mention the reoccurring themes that present themselves throughout the majority of the book. Despite each short being unrelated and diverse in form, there were certain factors that kept resurfacing; the heavy metal, the smoking (specifically marijuana and Camel cigarettes), and lastly, academia. It just didn't work for me all that much - instead of characters blending together, I would've preferred differentiating attributes. I always find it difficult to review these type of books, for the sole reason that I feel there's so much to write - I can get carried away with my thoughts and write paragraph upon paragraph. For my own sanity I've decided to forgo a ten-page essay detailing each and every short, and instead highlight the the top three that I enjoyed the most. This is the first story that really piqued my interest, primarily due to the fact I've never read anything quite like it before, and it caused me to think of how we, as a species, are awfully enticed by substances that alter the state of consciousness. It's said that we're always looking for the next big thing, the next high that will affect us in new and oftentimes dangerous ways. I liked how Thorn took that aspect, and spun something that didn't seem so far-fetched in regards to human cruelty. Whether the creature was a demon, an alien, or whatever else, I felt pity for it and thus viewed the people themselves as the monsters. The added possibility of there being another plane of existence only interested me further. And maybe I was screaming too, I don't know, but I'm quite sure I would've done something to stop this awful spectacle if I'd had the time, or the will, or even just a modicum of bravery. Clearly the ugliness of humanity's a personal favourite of mine; the type of horror that's closer to home and more real than any supernatural beast. This particular short reminded me of the film Hostel, with the concept that people pay money to hurt a stranger. The difference was, in this case, both parties acted upon a consensual basis, where rules and regulations were strictly set in place. I have no doubt that something like this exists today, and whilst I don't consider it terrifying in the traditional sense, it's immensely thought-provoking. But in this moment, money seemed like some grotesque abstraction; these terrible means dwarfed the process of reaching agreeable ends. Yet another example of human savagery, yet in an entirely different manner. Appreciating art as much as I do, I couldn't help but feel fascinated by Schluter's work and the way in which Thorn truly captured its disturbing essence. To turn actual people into such ghastly pieces of craftsmanship, it's delightfully macabre. The artist himself was a character I favoured because of the unnerving, yet obvious way he felt strongly for his victims - perhaps even a sort of love for them. To really look at one of Schluter's subjects was like seeing a reflection of yourself ten years from now, somehow locked in a stasis of fear and eternal nakedness. Other honourable mentions are The Auteur, Long Man, Sabbatical and Fusion. Of course, due to the differing of story-types, there were some I didn't care for, and some I outright disliked. With Mired, Fear and Grace, and Speaking of Ghosts, my attention considerably waned until I just wanted them to end as quickly as possible. In conclusion - A well-written concoction of the dark and twisted. My interest fluctuated depending upon the concept, but it's clear that Thorn has talent. An author to keep an eye on, for sure.